Friday, March 1, will be a great leap for Asian Americans — and for one Japanese American in particular, a giant step up Hollywood’s corporate food chain. That is because on that day, Kevin Tsujihara will become the CEO of Warner Bros. Entertainment, for those of you who were nodding off in class back in January when Time Warner Inc. rocked Hollywood with that announcement. Although he was a known quantity to many in the entertainment industry, the appointment put the reportedly low-key, low-profile but very smart Tsujihara in the spotlight as never before. By all accounts, it was that combination of personality and smarts, not to mention business savvy, that led his bosses — Time Warner Chairman/CEO Jeff Bewkes and retiring predecessor Barry Meyer — to pick him for the leadership position over rival execs Bruce Rosenblum and Jeff Robinov, who were also in contention for the post. For a Hollywood exec, it doesn’t get much bigger than being in charge of Warner Bros. Entertainment. Over the years that I’ve been observing Hollywood, I’ve not heard of another Asian American in such a high-level, high-profile post. Scott Sassa (NBC), Stephen Chao (Fox), Steve Tao (ABC; J.J. Abrams’ production company) and Chris Lee (Columbia Pictures) are some names that immediately come to mind with regard to other Asian Americans who were high in the pecking order at one time or another in their respective fields. But Tsujihara’s appointment trumps all those. In that sense, it’s heartening, not unlike seeing the NBA’s Jeremy Lin spark Linsanity about a year ago. In a sport dominated by African American players, along comes this Asian American kid who turns the world upside down, even if it was for a few, short-lived weeks. Who knows, maybe there was some sort of subconscious realization that in an industry dominated by Jews (I know you’re not supposed to say that — unless you’re Jewish), maybe this was a chance to let a capable person who was Asian American take a crack at leading the entertainment arm of one of the world’s leading media companies? While I have no doubts that Tsujihara is more than up to the task, I hope he has more staying power in his field than Jeremy Lin — who is still a work in progress — in his. In a way, it shows that despite the impact of folks like Jeremy Lin, Asian Americans — especially men — are still curiosities and anomalies, be it in corporate America or sports. 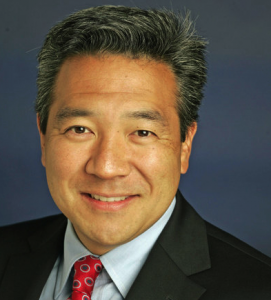 That said, is there anything we can expect from Kevin Tsujihara becoming a bigger wheel at Time Warner that is directly beneficial to Asian Americans? The answer is what it should be: no. While it’s inspirational that a Nikkei can make it so high up there in corporate America, his duty is to his company, its bottom line and its shareholders. So, for an example, as much as I’d like to see Kevin Tsujihara send a private memo to comedian Bill Maher, the host of HBO’s “Real Time,” telling him stop already with his racist Asian jokes or maybe add an occasional Asian American to his lineup of weekly panelists, that simply isn’t going to happen. Indirectly, though, having Tsujihara at the helm sends a positive message that when it comes to being behind the steering wheel of a major American corporation, contrary to what Bill Maher and his ilk seem to believe, Asians can drive. Lil’ Tokyo Reporter Dept. : Just a reminder: There are three screenings set for that aforementioned movie this Saturday, Feb. 23, in downtown Los Angeles. Tickets are supposed to be $9 for general admission and $7 for seniors and students, with matinees at 12:30, 1:30 and 2:30 p.m. (The website is ltreporter.com; check it before the screening, when it is sure to be updated with more specifics.) The address is 251 S. Main St. Hope to see you there! I read somewhere that he says he wishes that his father could see his success, but now he’s probably grateful that his father isn’t around to see his downfall. This article was written in 2013 when he was having the affair with the 19 year old actress. Especially as a Japanese-American where being CEO was an accomplishment for Asians in general in this industry, he sure lost a lot. For what? It seems hubris got the better of him. Not much thought given for his wife, his kids, and the greater community.